October 12, 2018 RHP Carlos Zambrano assigned to Navegantes del Magallanes. August 14, 2018 Leones de Yucatan released RHP Carlos Zambrano. July 5, 2018 RHP Carlos Zambrano assigned to Leones de Yucatan. October 7, 2014 RHP Carlos Zambrano assigned to Navegantes del Magallanes. January 31, 2014 RHP Carlos Zambrano assigned to Venezuela. July 25, 2013 Lehigh Valley IronPigs released RHP Carlos Zambrano. June 29, 2013 Carlos Zambrano roster status changed by Lehigh Valley IronPigs. June 11, 2013 RHP Carlos Zambrano assigned to Lehigh Valley IronPigs from Reading Fightin Phils. June 7, 2013 Carlos Zambrano assigned to Reading Fightin Phils from Clearwater Threshers. May 28, 2013 Carlos Zambrano assigned to Clearwater Threshers. May 17, 2013 Philadelphia Phillies signed free agent RHP Carlos Zambrano to a minor league contract. November 18, 2012 RHP Carlos Zambrano assigned to Navegantes del Magallanes. November 3, 2012 RHP Carlos Zambrano elected free agency. January 5, 2012 Chicago Cubs traded RHP Carlos Zambrano to Miami Marlins for RHP Chris Volstad. November 4, 2011 RHP Carlos Zambrano assigned to Caribes de Anzoategui. 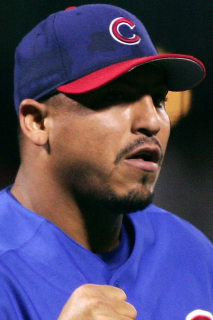 September 29, 2011 Carlos Zambrano roster status changed by Chicago Cubs. August 13, 2011 Carlos Zambrano roster status changed by Chicago Cubs. July 16, 2011 Chicago Cubs activated RHP Carlos Zambrano from the 15-day disabled list. July 8, 2011 sent RHP Carlos Zambrano on a rehab assignment to Peoria Chiefs. July 1, 2011 Chicago Cubs placed RHP Carlos Zambrano on the 15-day disabled list. Lower back soreness. October 4, 2010 RHP Carlos Zambrano assigned to Caribes de Anzoategui. July 30, 2010 Chicago Cubs activated RHP Carlos Zambrano from the restricted list. July 20, 2010 AZL Cubs sent RHP Carlos Zambrano on a rehab assignment to Iowa Cubs. July 19, 2010 RHP Carlos Zambrano assigned to AZL Cubs from Chicago Cubs. June 29, 2010 Chicago Cubs placed RHP Carlos Zambrano on the restricted list. June 26, 2010 RHP Carlos Zambrano suspended. October 9, 2009 RHP Carlos Zambrano assigned to Caribes de Anzoategui. August 25, 2009 Chicago Cubs activated RHP Carlos Zambrano from the 15-day disabled list. August 20, 2009 sent RHP Carlos Zambrano on a rehab assignment to Peoria Chiefs. June 4, 2009 Chicago Cubs activated RHP Carlos Zambrano. May 28, 2009 RHP Carlos Zambrano suspended. May 22, 2009 Chicago Cubs activated RHP Carlos Zambrano from the 15-day disabled list. May 16, 2009 Chicago Cubs sent RHP Carlos Zambrano on a rehab assignment to Daytona Cubs. May 4, 2009 Chicago Cubs placed RHP Carlos Zambrano on the 15-day disabled list. Strained left hamstring.